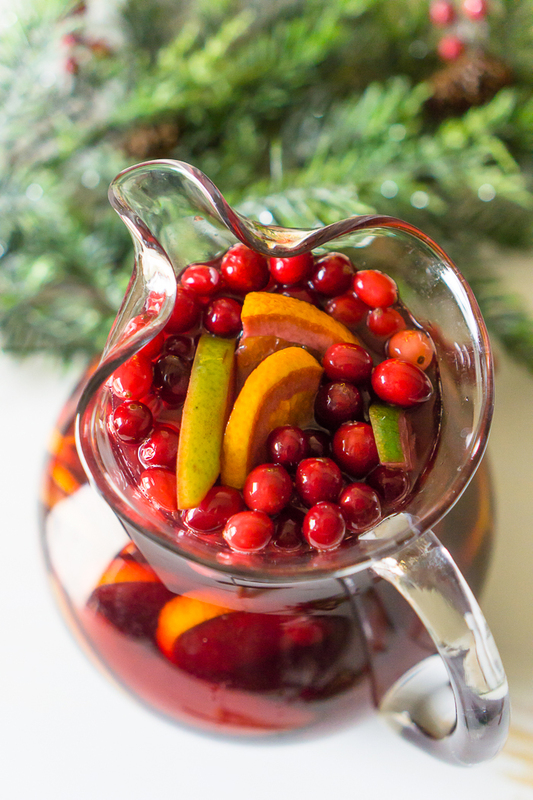 Don’t forget to add a special holiday cocktail recipe to your Christmas menu this year, like this Easy Holiday Sangria! Filled with cranberries, citrus, pears, a subtle hint of cinnamon, and sweet red wine, you’ll love every sip of this red sangria recipe! 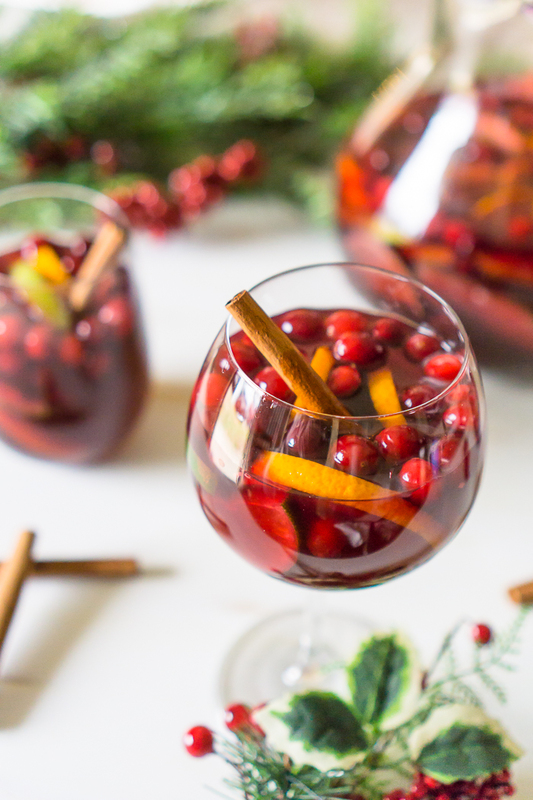 A Red Sangria Recipe that’s Perfect for the Holiday Season! As you may or may not know, I am a bit fan of sangria recipes but I’m an especially big fan of having some good Christmas punch recipes on hand for holiday party season. They are so easy to make and offer to guests without the need of anyone playing bartender. I already shared with all of you a sparkling White Christmas Sangria that is light and tangy, and filled with green and red fruit for a festive presentation. It’s amazing! However, there are lot of people who prefer red wine so I also wanted to offer you a festive red Christmas Sangria, too! In the past, I would spend so much time preparing a holiday menu plan and start cooking all of the food that I quickly forget about what I’m going to drink on the actual day. Not anymore! Holiday cocktails are being planned first. With how stressful the holiday season can be, doesn’t that sound right? These two christmas sangrias and my White Cranberry Margaritas will always fall to the top of that list, too! You should give them a chance if you are looking for holiday punch cocktails. Since I knew I was starting out with a red wine base for this sangria recipe, I knew I could go slightly bolder in flavors which is why I chose to work with cranberries and oranges as my main flavor inspiration. Cranberry orange is one of my favorite fruit combinations and appeared as Cranberry Orange Margaritas this year and Cranberry Orange Scones, so it was an easy decision for this holiday cocktail recipe. Then I decided to add a bit more citrus with lime slices and crisp pears, too. If you want to just stick with oranges and cranberries, you could definitely do that. You always want to make your sangria first thing in the morning or even the day before so that all your fruit and flavors have time to mingle together. This is especially important for adding in the cinnamon sticks. 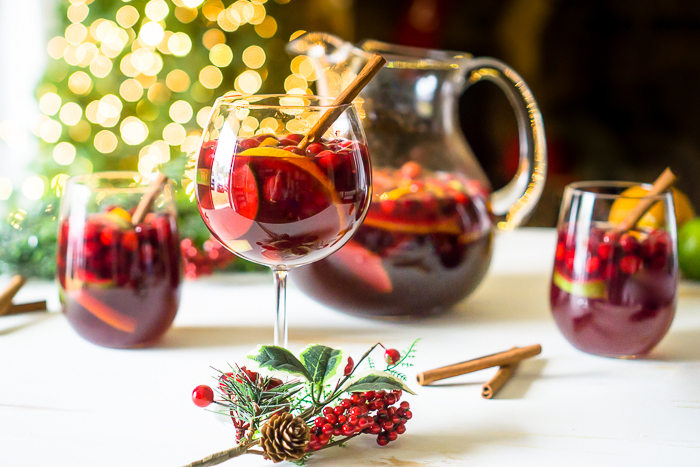 Doing so is not going to give the sangria an overpowering cinnamon flavor, like adding the spice straight into the recipe would, but allowing them to soak will give the sangria a subtle spice that’s great on a cold winter night! Generally speaking, you are looking for a fairly inexpensive, fruity wine that tastes good on its own (though maybe not your favorite on its own). If you have knowledge of wine, I also recommend finding something with lower tannins. I will usually pick out a bottle of malbec, pinot noir, or garnacha around the $10 range for my red sangria recipes. Glass Pitcher – You want one big enough to hold all the ingredients and fruit and one pretty enough to showcase your gorgeous holiday cocktail! 12″ Beverage Stirrer for Pitcher – It makes prepping your cocktail recipe easier, especially with those that need a quick stir before serving up to guests. Holiday Stemless Glassware – It’s a holiday sangria recipe, so you need extra special glasses for your drink! Rose Gold Cocktail Shaker and Double Sided Jigger – I’ve become a convert to keeping a jigger on hand for all my cocktail making. Plus in rose gold, these are so pretty for your holiday bar! Mix Up Your Citrus Cranberry Sangria and Enjoy! 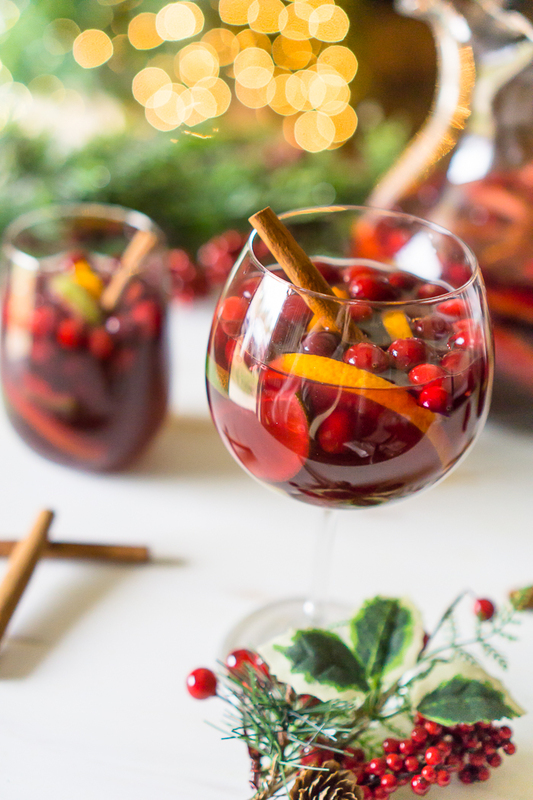 Don't forget to add a special holiday cocktail recipe to your Christmas menu this year, like this Easy Holiday Sangria! Filled with cranberries, citrus, pears, a subtle hint of cinnamon, and sweet red wine, you'll love every sip of this red sangria recipe! Add all the ingredients into a large pitcher and stir well. Allow for sangria to chill for at least 4 hours. Can also chill overnight. Make sure to stir before serving. You can use a slotted spoon or a pair of tongs to help extract fruit for each glass and garnish with a cinnamon stick for a prettier presentation. If not properly chilled, you can add ice.